With the opportunity to paint a few models from the Dark Vengeance set, my friend asked that I paint up the Chaplain and the Librarian models for his DIY chapter. The Chaplain is already complete and it's time to get cracking on the Librarian. The one small conversion that was done to this model was a sword swap. Sounds simple, but swords can be a huge pain to do with trying to get all the pieces lined up correctly so it looks like one solid weapon and it's not bending in ten different directions. The sword I am using is a Daemon sword from a Bloodletter I think. At least that's what it looks like given the arm that was attached to it. It took some fiddling around to get the new weapon to match up with the Librarian arm given the position it's in. I wanted to be careful how much I hacked it apart as I wanted to keep some stability in the arm. Once I had my new blade and hilt in place (and pinned of course), I added some greenstuff work to the inside and outside faces to bulk up the fragile joint and hide the new connection. On the inside, I added the power cable back in place. I like this one since I'm able to use what is already there to hide the new bit. On the outside, I added a small swirl that I will paint in a metallic color. It's shaped like the effect Librarian's have on their traditional power weapons. The new sword is meant to be a relic of some sort that's not normally carried and so it will be painted to look the part as well. After looking at it for a little while, I opted to add a small band around the hilt just under his hand to bulk out the lower portion of the hilt. It's not much, but I think it helps balance the weapon out. This guy is going to be painted to a higher standard than the normal tabletop level so I'll be posting some pics of the finished model once I get him done. That's really nice. I like the swirl on the blade - you really nailed that design. Very nice work, definitely looking forward to seeing how it looks painted up! This is nice; sword swaps can indeed be tricky. How did you pin it exactly? I've always found drilling the holes in such thin parts can deform the pieces. Was it just a case of using a very thin wire and drill bit? Also, might it be an idea to remove the Khornate icon on the sword's pommel? Perhaps 'adapt' it to more resemble the traditional Librarian horned skull? Really nice Ron! Can't wait to see it painted up. well 2 things, 1) I thought that the dark vengence set came prepainted? and 2) I would like to challenge you to do a set of things on the exorcists when you have time. Like show how you would do a custom exorcist chaplain and the badge freehand and how you would make the sigils and hexagrams look carved onto the armor. They are codex compliant but there are no specific detail examples so i would like to see what you would do. Damn, tha hellblade looks amazing on that mini. 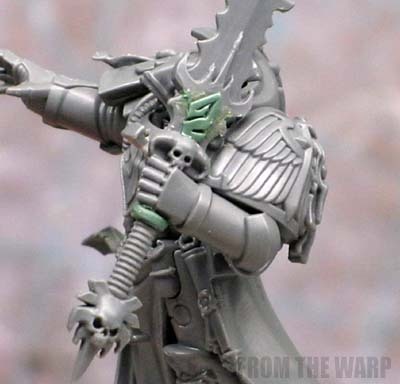 That looks like one hell of a fiddly conversion, lining up sword hilts and blades and the like is a nightmare. Gotta second the quibble about the sword pommel though, still pretty recognizable as a Khorne symbol. Thats a great swap on that Force Weapon. I also have to agree on the sword pommel. Sorry. Its still way too Khornate for me. Could we see him on a bigger picture? I'm wondering how the sword that size fits to marine figure scale. Can't wait to see the finished item, it's going to be awesome! So is it right that you use two pins for the sword? It might be lazy or cheating, but I've always found that for sword/ weapon swaps it works well to drill through the entire hand, and use a single long pin between both blade and handle. It adds stability, and that way there's no question of whether or not you lined the two up properly. I see what you all mean about the Khorne symbol on the weapon. As of now, it's staying for that very reason... as a hint of dark things and where the weapon might have originated. Zab: I used the swirl to help hide the connection on the outside face of the weapon. pingo: Yes, this was a bit tricky since the weapon is so thin where the pin is. I use a small paperclip for the "wire" and the regular GW drill to do the work. It's a matter of taking your time and not applying too much pressure as you drill. It's more like letting the drill bit cut out the material as opposed to you pushing it down in to bore it out. I've found applying just tiny bit of pressure (just enough so the drill bit scrapes away at the surface) is often enough to keep the piece from deforming. Folks try to drill things out and be quick about it. I tend to go quite slow. Anon: I wish it came pre-painted. I'd settle for assembled and all I had to do was paint. Unfortunately, there is a good amount of work to do on these guys before they can be used. And are you talking about the Exorcists chapter? I can certainly do a quick tutorial on how to show things etched into armour. Their symbol is similar to a standard Librarian skull it looks like. I have a tutorial on how I paint those here. Psish: It's big. As big as him and maybe even slightly bigger. It's definitely 40k scale. Muninn: Yes. I like to use one pin like you mention when I can, but the bit (the libby sword portion) here was so thin, I did not want to push my luck and damage it in any way. I kept the pin hols somewhat shallow as well just in case the model is dropped, the bits will pop off without completely deforming the model. thanks for the link for the horned skull and a tutorial for etched looks would be awesome! 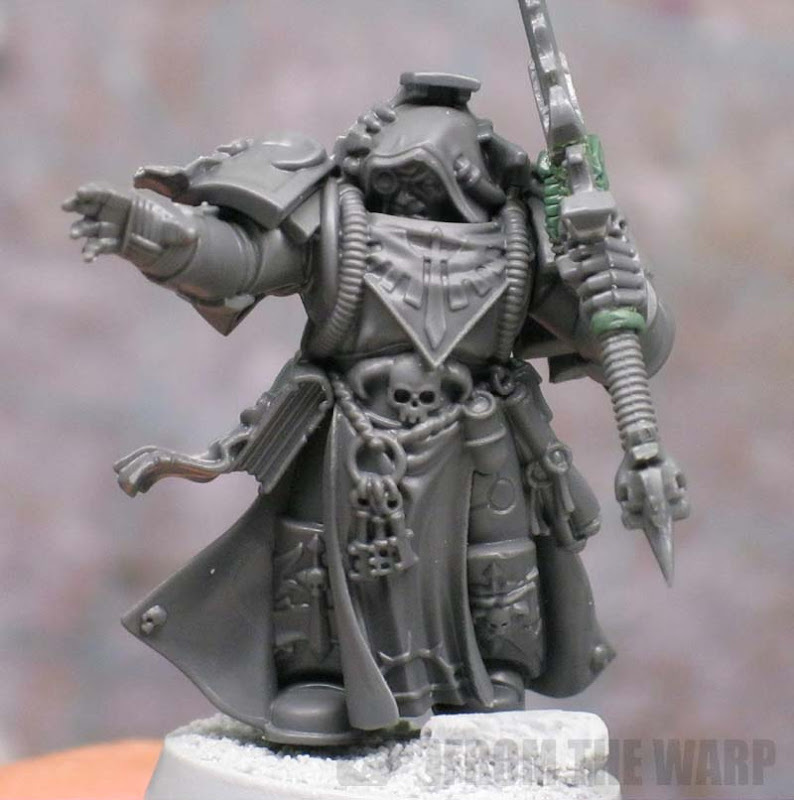 The thing about the chaplain and librarian was I noticed a distinct lack of examples and just wanted some thoughts on how to make them EXORCIST librarians/chaplains rather than just a librarian/chaplain with an exorcist shoulder pad. To that end your "librarians should be blue" article was very interesting and maybe you should try again because I can tell you the flesh tearers librarian was distinctly different so it didnt need to be blue - the top picture on the other hand just looked like a terminator so i can see where that original confusion came from. Making something or someone belong to a particular chapter is done by combining a few things I think. One being the color scheme (blue for Librarians), another being iconic elements (a Crozuis for Chaplains) and then trying to find and add that one characteristic that not most folks know about unless they understand the chapter. For example, maybe including feathers on Deathwing termies. Not everyone knows the significance of feathers, but it's a different element and for those who do know, it's like being let in one a secret that identifies the chapter you're trying to portray. To that end, I would say use the Exorcists color scheme, include those iconic elements and then find that one thing about them that sets them apart from other chapters and include that... whatever it may be. The Flesh Tearer librarian was missing that color scheme aspect to help viewers identify the model easily. Whether we like it or not, we can have the coolest model/conversion/paintjob in the world, but if nobody knows what it is... you'll spend forever trying to explain it to everyone. thanks for another reply, that is actually exactly the advice I was looking for. Now I just need to think of a way to show those special traits of the exorcists and I'm just look for input from any reader not just you Ron the chapter has 3 scout companies because every full battle brother has to survive a demon possession because that is how they become such good exorcists so I need to think of a way to show that on the full battle brothers and also none of them are psykers, in fact and if I remember correctly, they have no presence in the warp so i can ditch the psych hoods. Also I do look forward to your etching tutorial, if you are planning to make it (I don't expect it since I have no right to expect someone on the internet to something you are a free person) thanks for all the help so far too. Let me see what I can do this weekend. I might have a spare shoulderpad lying around that I can use to demonstrate the technique.